Our passion, at Healthlines, for both the Mediterranean and for the world of Essences came together in 2002 and the Mediterranean Essence Project was born. Flower, Environmental and Mineral Essences have been made all over the Mediterranean, from East to West and North to South and on the islands, scattered like jewels accross the middle. The Mediterranean is a rich and magical arena. Everywhere you turn there is the inspiration and influence of thousands of years of human exploration, expanding horizons, spiritual searching, creativity and innovation. There is the fascinating meeting of diverse cultures, religions and languages, and the joy, beauty and brightness of the colours, the sea, the sky, wonderful flora and fauna, land and seascapes. It’s like the most vibrant and alive painting. The energy of all of this pours into our Mediterranean Essences. And what can the Essences do? They can support us in letting go of our out-of-date stories and beliefs. They can guide and ground us through times of transition and transformation. They can help us reconnect with our inspiration and our dreams. They encourage us to have life be easier, whilst also staying focused on what’s important. And they invite us to step up, because that’s what we came here to do and now is the time. To step up, become empowered, speak our truth and to shine our lights for all to see. 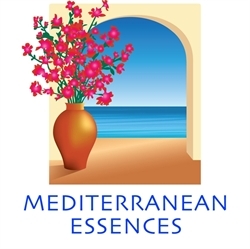 We offer them to you because Mediterranean Essences can profoundly contribute to our human journey in these powerful and exciting times. You can see Angie presenting some of these Essences by following this link to the Youtube playlist. 21 Mediterranean Essences in 15ml stock bottles. Presented in a beautiful box with a descriptive booklet.